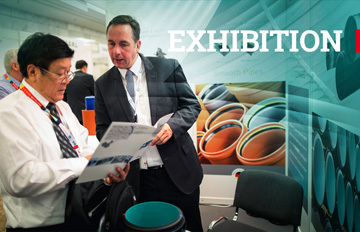 A technical exhibition will accompany the Conference, which will feature important aspects of the plastic pipes business and show some of the new developments in product design, manufacture, maintenance, evaluation and testing procedures. Please visit the website and you can reserve your booth online on a first come, first served bases. 3x3 booth, 1 exhibition table, 1 table + 2 chairs, 3 spot lamps, electric connection with 1 plug, 220VThe Conference registration fee for 1 participant is included. Please visit the layout of the exhibition on the website, please click here. There is an opportunity to reserve the required location of your booth if the area is empty. We will hold your reservation until your payment is received. Payment is required within 8 days. As soon as your payment arrives the reservation will be validated and your reserved booth will be red on the map of the exhibition area. All valid reservations will be confirmed in 3 days. You may arrange the payment by bank transfer (download our Vendor Details) or mail order transaction (download our Credit Card Form). The applicant or his representatives shall be responsible for properly insuring the exhibition goods as well as all other equipment and fittings against all transport, assembly and dismantling risks as well as during the event itself, against damage theft etc. Indirect damage and loss of earnings shall be excluded from the liability. The applicant or his representative shall be liable for all damage caused by their participation vis-á-vis third parties, including accidents to person or persons, damage caused to buildings and the exhibition grounds as well as on these and the fixtures and fittings thereof. The applicant shall expressly indemnify Evacon Ltd. against any possible third party recourse claims resulting there from which were not caused by the gross negligence or intentional behavior of Evacon Ltd. or its vicarious agents. No refund after 30 June 2020. Eva Ori – Evacon Ltd. Address: H-1136. Budapest, Tátra Str.34.